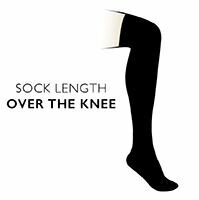 Versatile, soft and seriously stylish, Trasparenze Caballero 70 Denier Over the Knee Socks are an indispensable accessory if you like to wear shorter length kilts or skirts, and, made from a smooth microfibre, they look every bit as good as they feel. These Italian designed and manufactured plain opaque 70 denier socks are fine, but provide great coverage, as well as warmth and comfort. If you’ve got the legs, why not flaunt them? Height (feet/inches) 4'10"-5'6" 4'10"-5'8" 5'4"-6'0"